Amsec B Rate Depository Safes | Amsec Depository Safes: Accu-Safes Inc.
AMSEC’s DS series Deposit safes are designed to provide immediate deposits and secure storage for cash, jewelry, and miscellaneous valuables. Deposits on the DSF2014C can be made through a locked door via a front-loading deposit door. Recessed, heavy duty 3/16" construction (1/4" door).Protected by dual “anti-fish” baffles. This economical steel safe provides your employees a place to drop excess till cash. By making regular drops, the excess cash is not a temptation to employees and reduces the threat of hold ups. Better cash control also improves employee morale! The front load hopper on the AMSEC Deposit Safe easily handles drops of up to 4 x 2 x 9 inches and provides a saw tooth baffles inside to protect against "fishing". The hinged door allows access to the compartment were the drops are made. This AMSEC Deposit Safe features a solid 1/4" steel body 1/2" steel door with three 1" steel chrome bolts (a feature not found in other less expensive models). Your DSF2014C Depository also has a bolt detent system which activates the bolts when the door is closed; a simple turn of the combination dial locks the door securely. We have also gone the extra step to add hardened steel plate around the lock and re-locker to protect from drilling.The outside height of the AMSEC DSF2014C Deposit Safe is 20 1/4" in height to allow you to put the safe under the counter nearer the register for ease of use. We have also included 4 anchor bolt holes in the bottom, a must when adding additional security by bolting it to the floor. The formed shell surrounding the door reduces the likelihood of prying by an unwanted burglar. The DST2014 Deposit Drop Safe contains features the less expensive manufacturers can't touch. Here are some of them: a bolt detent system that engages the bolt work automatically with the door is closed, an auxiliary spring loaded relocking devise (automatically locks the bolts if the combination is drilled or punched), three large 1" locking bolts and a U.L. approved Sargent & Greenleaf Group II combination Lock. Did we also mention there are 4 pre-drilled anchor holes in the DST2014 safe bottom? We strongly recommend that all safes be bolted to the floor. The specially designed door is made to resist prying and sledgehammer attacks by burglars. There is also a special hardened steel plate that protects the vital parts of the safes such as the combination lock and relockers. This feature alone has foiled many a break in attempt. 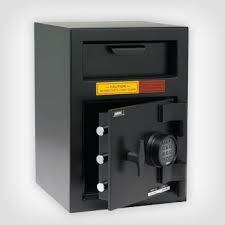 Please keep in mind these deposit safes are not for overnight storage of large amounts of cash or negotiable's. AMSEC’s DSR2014C Deposit safe is designed to provide immediate deposits and secure storage for cash, jewelry, and miscellaneous valuables. Deposits for the DSR2014C can be made through a locked door via a reverse hopper located on the back side of the safe. The AMSEC Deposit Safe DSR2014C B-Rated Burglary Safe features a hopper placed at the rear of the safe. The concept of the safe is that it can be placed in a wall with the hopper on one side and the door, with access to the drops on the other side. This safe has many uses. It has been used in hospitals for patients personal items, food vendors making deposits late at night after returning from a route to schools and making deposits after athletic events. You can think of your own use for this unique safe. 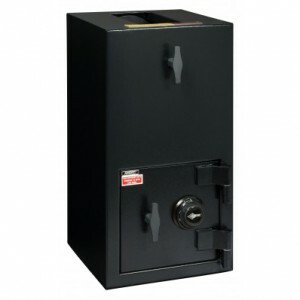 The DSR 2014C Reverse Hopper has all the features of our other popular deposit safes. Those include 1/2' thick steel door with a 3/16" thick steel body with a special formed door to resist prying. Four anchor holes are standard along with an approved U.L. Group II S&G combination lock. Oh, and let's not forget the bolt detent system with throws the bolts to the closed position when the door is closed. Did we mention the bolts(three of them)are made of 1" thick diameter solid steel? Also added is the spring loaded relocking device and hardened steel plate protecting the combination which has foiled many an attempted break in. The AMSEC Deposit Safe pull down hopper in the rear of the DSR2014C can handle packages up to 4" x 2" x 9" in size. The inside storage capacity is 1500 cubic inches or a size of 10" x 13" x 11". The safe comes in a matte black finish with a black dial and white numbers for easy reading of the combination. As with all of our safes, the AMSEC Deposit Safe DSR2014C B-Rated Burglary Safe has the quality built in to provide a long life of constant usage. As with our other deposit safes the DSR 2014C Reverse Hopper is not for the overnight storage of cash or valuables unless personnel are present. The AMSEC Model DST2714C Deposit Drop Safe contains features the less expensive manufacturers can't touch. Here's some of them: a bolt detent system that engages the bolt work automatically with the door is closed, an auxiliary spring loaded relocking devise (automatically locks the bolts if the combination is drilled or punched), three large 1" locking bolts and a U.L. approved Sargent & Greenleaf Group II combination Lock. The safe is painted black and features a "T" handle which easily turns with the lock has been opened. As you can see the AMSEC Model DST2714C is loaded with features that can help protect the movement of your businesses cash. Did we also mention there are 4 pre-drilled anchor holes in the bottom of the safe for additional security. We strongly recommend that all safes be bolted to the floor. The specially designed door is made to resist prying and sledgehammer attacks by burglars. There is also specially hardened steel plate that protects the vital parts of the safes such as the combination lock and relockers. This feature alone as foiled many a break in attempt. Please keep in mind this AMSEC Deposit Safe Model DST2714C B-Rated Burglary Safe along with other similar deposit safes are not for overnight storage of large amounts of cash or negotiable's. 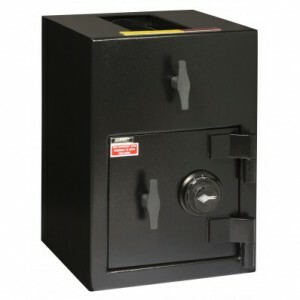 Model Number 2714 Deposit Safes 1/2" thick A36 solid steel plate, recessed 1/2" to increase resistance to pry attack . U.L. Group II combo lock (C), U.L. listed dual nose keylock (K).Three 1" diameter chromed steel locking bolts.Bolt detent system engages boltwork automatically.Auxiliary spring-loaded relocking device.Lock and relock protected by large carburized hardplateRecessed, heavy duty 3/16" construction (1/4" door).Protected by dual “anti-fish” baffles. The AMSEC Deposit Safe Model DST3214CC B-Rated Burglary Safe is yet another versatile deposit safe in a long line of products manufactured by American Security Products. This Double Door Deposit with Rotary Hopper safe provides better theft protection, especially from internal factors. The upper door allows access to the drops that the rotary hopper releases and has its own access lock. The rotary hopper can handle drop sizes up to 6" x 5" x 10". The lower compartment, usually used for coin and extra bill storage has a separate lock with a different combination. The AMSEC Model DST 3214CC has all the great features of the other depositories made by AMSEC which include features like our "B" rate construction (1/2" steel door and 1/4" steel body), a Group II combination lock protected by specially designed carburized hardened steel plate. For more security we have added special carburized hard plate that protects the combination lock for being drilled, a common method of forcible entry.